I’ve been trying to eat healthier for a while now. It’s taken me a while to find healthy food options that are not just good for me but that I would actually enjoy eating on a regular basis. These are a few go to ideas that I reach for when I want a healthy breakfast. I discovered this cereal thanks to ttsandra on Youtube. While the texture took some getting used to, it does a phenomenal job at keeping me full until my pre-lunch snack. 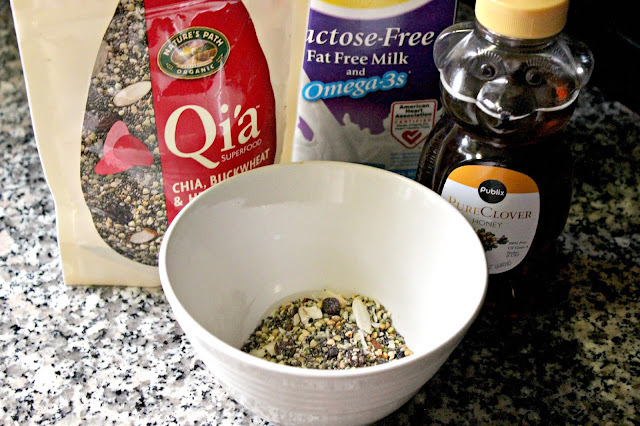 I put two tablespoons qia and 4 to 5 tablespoons of milk in a bowl and wait 5 minutes for the chia seeds to expand. I also add a teaspoon of honey to sweeten it up a bit. On it’s own it tastes pretty bland and squishy but with the honey it’s actually pretty tasty. I discovered this while searching healthy recipes on Pinterest and i have never looked back. this is by far my favorite healthy breakfast. I mash up half an avocado on a piece of wheat bread, my favorite is Arnold 100% Whole Wheat. Then, I put two sunny side up eggs on top, sprinkle some pepper, and viola breakfast is done! Unfortunately, I don’t wake up early enough most days so I tend to make this on the weekends. I add a rounded scoop of chocolate protein powder to 1 cup of milk. Then I add a frozen banana and a tablespoon of peanut butter. It is so delicious and surprisingly filling on its own. When I’m in a hurry, I usually just use the protein powder and milk in a blender bottle and I’m out the door. If you’re looking for a good protein powder, I highly recommend Gold Standard 100% Whey Protein Powder. I get a 5lb tub on mine on Amazon for about $60. I have it in chocolate and vanilla flavor and they are both awesome! This is usually something I fix when the weather is cooler but I wanted to include it because it is a great option if you like oatmeal. Each serving has 10 grams of protein and I find it’s much more filling than regular oatmeal. Usually, I put dried cranberries on top and it gives just the right amount of sweetness while still being relatively healthy. Hopefully you enjoyed finding out what I like to eat to have a healthy start to my day. It’s a departure from my usual posts but I had a lot of fun writing this one! Look out for more food related posts in the future! What do you eat for a healthy breakfast? These are some great breakfast ideas! I personally love avocado and tomato on toast in the morning or even some yummy porridge! Thanks Anjelique! Oatmeal is my go to breakfast in the winter. It is just so quick and satisfying! I can't get enough of smoothies now that summer is in full swing! Thanks Ayah and Kimmy!